There is a limit of 200 entries to the Snowdon MG Run 2018. 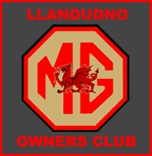 Please Note The Snowdon MG Run will Start from Llandudno Promenade and will Finish at Betws-y-Coed. If you have entered the Snowdon Run or about to. We have s special deal with the Bay Marine Hotel as registration will be at the Bay Marine Hotel on Saturday night and Sunday morning make the most of the weekend. Tel 01942 417918 tell them you are on the Snowdon Run. For Accommodation contact the Tourist Information Centre. Tel. 01492577577. or email llandudnotic@conwy.gov.